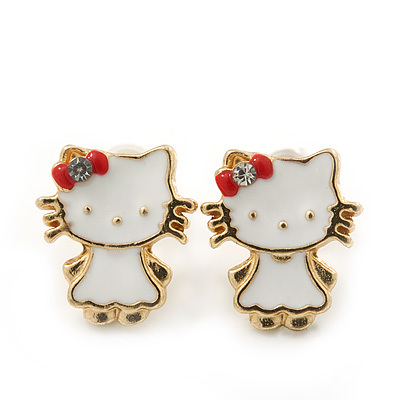 Add a pretty touch with these cute Children's/ Teen's / Kid's Tiny White Enamel 'Kitty With Red Bow' Stud Earrings In Gold Plating. Featuring a lightweight adorable kitty with bow design, crafted in gold plated metal and covered with enamel detailing in hues of white and red. Each bow accented with a tiny clear crystal for a dash of sparkle. They measure about 11mm in length and secure with post backings to hold your earrings securely in place. Fresh and summery, these studs are a gorgeous way to refresh your style. Each earring weight is about 1g. All products are 100% nickle and lead free to comply and exceed UK legal requirements, so you can be confident and safe with your new purchase. The weight shown in the details above is the total weight for 2 earrings.